1652 ~ 1676: born in Kyôto. His father was a lacquer ware craftman. He started his career at an unknown date, performing under the name of Yobuka Hanzaemon. 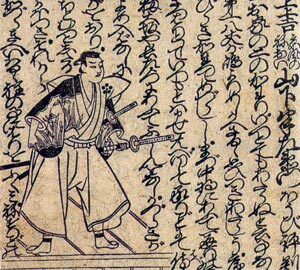 1676: Yobuka Hanzaemon took the name of Yamashita Hanzaemon and performed as a wakashugata in Kyôto at the Nawate no Shibai. 17th day of the 5th lunar month of 1683: the courtesan Yamatoya Ichinojô and her lover Goze no Chôemon committed suicide together in Ôsaka. This event caused quite a stir and three Ôsaka theaters decided to capitalize on the situation by simultaneously producing the first shinjûmono of Kabuki history [more details]. Yamatoya Jinbê II produced this shinjûmono, starring the actors Murakami Ichinojô and Hanzaemon in the roles of the courtesan and her lover. 11th lunar month of 1686: Hanzaemon performed as a tachiyaku in Ôsaka at Araki Yojibê I's theater. His yearly salary was 200 ryô; his stage partners were Araki Yojibê I, Iwai Hanshirô I, Yamamura Kanzaburô, Sakurayama Rinnosuke I, Sodeoka Masanosuke II, Sakata Tôkurô, Takenaka Hanzaburô, Matsushima Han'ya II, Kozakura Kodayû, Takigawa Kiyosaburô, Yoshikawa Genzaburô, Mihara Jûdayû I, Wakabayashi Shiroemon and Sadoshima Denpachi. 1st lunar month of 1687: Hanzaemon's rank in "Yarô Tachiyaku Butai Ôkagami", the first hyôbanki in Kabuki history, was jô (superior). He shared this ranking with Araki Yojibê I, Uemura Kichiya II, Takeshima Kôzaemon I, Suzuki Heizaemon I, Nakamura Kazuma I, Takenaka Kichisaburô, Fujita Koheiji I and Karamatsu Kasen. 3rd lunar month of 1693: Hanzaemon became zamoto and produced in Kyôto at Miyako Mandayû's theater Chikamatsu Monzaemon's drama "Butsumo Mayasan Kaichô", which was written for the star Sakata Tôjûrô I; Hanzaemon played the role of Itohori Magosaku. 1695: Hanzaemon's rank in the Kyôto hyôbanki, tachiyaku section, was jô-jô-kichi (superior - superior - excellent). 11th lunar month of 1697: Hanzaemon produced in Kyôto at Hayagumo Chôdayû's theater the drama "Miyako no Ehô Yomeiri Bunshô", which celebrated the arrival in the Imperial City of the Edo actor Nakamura Shichisaburô I. 1st lunar month of 1698: premiere at Hayagumo Chôdayû's theater of the drama "Keisei Asama-ga-Dake", which was produced by Hanzaemon; he played the role of Hanaoka Wadaemon [casting]. 11th lunar month of 1704: Yamashita Hanzaemon I took the name of Yamashita Kyôemon I and played in Kyôto at Miyako Mandayû's theater the role of Izuminosuke in Chikamatsu Monzaemon's kaomise drama "Kisshô Tennyo Anzan no Tama". 11th lunar month of 1707: Kyôemon played in Kyôto at Miyako Mandayû's theater the role of Sanjô Kichiji in the kaomise drama "Sanmen Daikoku Zeni". 11th lunar month of 1708: Kyôemon moved to Hayagumo Chôdayû's theater and played the role of Sanjô Kichiji in the kaomise drama "Ebisukô Musubi no Gojin". 11th lunar month of 1709: Kyôemon moved to Ebisuya Shôdayû's theater and played the role of Kuranosuke in the kaomise drama "Yomeiri Ôkeizu". 11th lunar month of 1710: Kyôemon played in Kyôto at Ebisuya Shôdayû's theater the role of Kokonoe Inarinosuke in the kaomise drama "Inari Chôja Yotsugimaru", which was produced by his disciple Yamashita Karumo; his stage partners were Fujikawa Buzaemon I, Yoshizawa Ayame I and Sawamura Chôjûrô I. 7th lunar month of 1711: Kyôemon played in the same theater the role of Hanaoka Wadaemon in the drama "Keisei Asama-ga-Dake"; his stage partners were Yoshizawa Ayame I (the courtesan Miura) and Sawamura Chôjûrô I (Asama Tomoenojô). The performance was a huge success and was extended up to october 1711. 1st lunar month of 1712: Kyôemon played in the same theater the role of Wankyû in the drama "Onna Wankyû", which was produced by Yoshizawa Ayame I; the role of the courtesan Matsuyama was played by Uemura Kichiya III. 1st lunar month of 1713: Kyôemon went to Kameya Kumenojô's theater and played the role of Mikura Kingoemon in the kaomise drama "Fukubiki Miuma no Ôkamado". 3rd lunar month of 1713: Kyôemon played in the same theater the roles of Kusunoki Masanari and Bingo no Shôji in the drama "Onna Kusunoki". Fall 1713: Kyôemon went to Edo to perform at the Nakamuraza but he did not appear on stage and went back to Kamigata. 1st lunar month of 1714: Kyôemon played the role of Hanaoka Wadaemon in the drama "Keisei Asama-ga-Dake", which was produced by Yamamoto Hikogorô in Ôsaka; his stage partners were Sawamura Chôjûrô I (Asama Tomoenojô), Kirinami Takie (the courtesan Miura), Yamashita Kamenojô I (the courtesan Ôshû), Ôtori Michiemon (Hyôsuke) and Ôshima Kajûrô (Yotarô). 1st day of the 11th lunar month of 1715 : his best disciple Kataoka Nizaemon I died. 1st lunar month of 1716: Kyôemon played in Kyôto at Hoteiya Umenojô's theater the role of Shirasuga Rokurô Saemon in the new year drama "Keisei Otokoyama". 3rd lunar month of 1716: Kyôemon appeared on stage for the last time, in the same theater, playing the role of Wadasaki Man'emon in the drama "Keisei Sennin Kagami". He retired from the Kabuki world. 18th of the 1st lunar month of 1717 : Kyôemon died. Yamashita Kyôemon I was a Kyôto stage giant of the Genroku era. His stage presence and his vocal projection were both outstanding. He was equally at home in sewamono and jidaimono dramas and excelled in jitsugotoshi and budôgoto roles. He was the founder of the Yamashita clan.